What better way to spend your Tuesday night than by rocking out with The Pretenders? The iconic band will play Chicago for the second time this year Tuesday night, August 18, headlining a triple bill with Cat Power and Juliette Lewis. 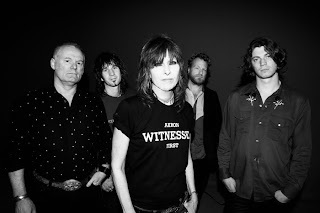 Last October, Chrissie Hynde and the band released Break Up the Concrete, their first new LP since 2002's Loose Screw. The stripped down, rockabilly-flavored record brought the them some of their best reviews in quite a while and seems to have kicked the band into high gear. They toured the U.S. early this year (which included a Chicago stop at the Riviera, reviewed here), made rounds in Europe through July, and are now back for round two in the States. Acclaimed singer-songwriter Cat Power released her eighth album, Jukebox, last year, while singer-actress Lewis has just come off a six year stint fronting Juliette and the Licks and is now set to release a new album, Terra Incognita, on September 1st. Tickets are $44 and are still available here.